I was recently sent bottles of skincare oils by Trustedhealthproducts.com to try out. They are the same company that makes Ora Md the teeth cleaner I also reviewed. They came out with a new products for your skin called Beautiful. 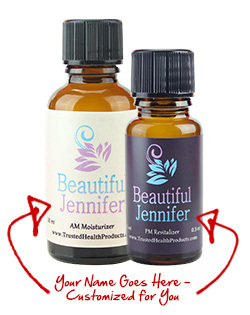 Beautiful are 2 different bottles of different oils for your face. There is a AM oil and a PM Revitalizing Oil. The 2 bottles come with your name printed on the front which I thought was pretty clever and perfect for gift giving. I used the products everyday since receiving them and I honestly love them. I loved the AM oil under my foundation because it seemed to fill in any line and give a smoother look to my skin. Compared to when I used my foundation without the oil underneath there was a difference. The PM oil gave me the perfect amount of moisture on my skin after washing so my skin was no longer tight. My skin is more combination with some small breakouts and the oil kept my skin from breaking out. I wear a heavy foundation so I usually need to wash my face a few times to remove all the makeup. I didn’t use the oils to wash my face with but I think if you use a normal foundation or little makeup these oils would be great to use as a cleanser too as the website says. 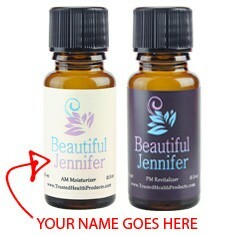 These oils are perfect for gift giving especially the way they are packaged with the persons name printed on it. Check out their website for more info on these products or their other ones. There are also a lot of great reviews from customers regarding these products you can read on their site.